Every business needs to invoice customers, and particularly with startup businesses, the invoice does not have to be complicated or pretty. This is a free basic invoice template for small businesses that only need simple invoices to bill their customers and/or clients. In Canada, this means that this service invoice template is for small businesses that do not have to charge federal taxes in Canada (Small Suppliers, who by definition, don't have to charge GST (Goods and Services Tax) or HST (Harmonized Sales Tax) and do not do business in a province where they would have to charge Provincial Sales Tax (PST). (Remember, there is no Small Supplier exemption for PST). Feel free to use this free invoice template as a model for your own simple invoices. If you like, you can copy it into MS Word or some other word processor, and substitute your relevant data, using your own customized business letterhead, and format the invoice template as you desire. If your small business is also selling products, it's a simple matter to add another section to this service invoice headed Invoice for Products and then listing those purchases. Note that this invoice template does not include a Business Number (sometimes called the GST Registration Number) because I've assumed that a small business that was not a GST/HST registrant wouldn't have a business number. If your small business does have a business number, you would put it on your invoice, of course. Also note the statement at the bottom of the invoice, saying that the invoice amount is due within 30 days. 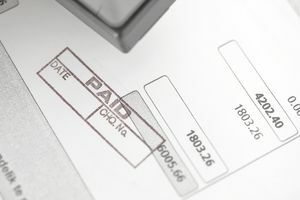 You'll often see invoices that say, "Payable Upon Receipt", but that's just asking for trouble because you don't necessarily know when your customer or client is seeing the invoice, particularly if you’ve sent it out by regular mail. Using a specific terms statement like the one on this invoice gives your ​customer a due date, and helps you to avoid collection problems. Regularly reviewing your accounts receivables and following through on unpaid invoices is an important part of maintaining cash flow in your business. Invoices are even easier to do if you use accounting software. When your business is in the startup phase keeping track of invoices is a simple chore but as your business grows you will find that your bookkeeping requirements become more complex and time-consuming. Accounting software designed for small businesses can not only be used as POS (Point of Sale) systems and print out invoices on the spot but make it easier to calculate and keep track of taxes, such as the GST/HST. There are a number of inexpensive, easy to learn, cloud-based accounting packages available for small businesses.